In this piece, the sense of sight is celebrated by the Lady looking with the mirror, with her unicorn by her lap. From the series of tapestries from the famous medieval series. The Lady and the Unicorn, rediscovered in 1841, is now in the Musee national du Moyen Age, formerly known as the Musee de Cluny in Paris, France. Here the lady is holding the mirror to reveal the reflection of the unicorn, also accompanied by the graceful lion holding the pennant or flag of the family crest of the La Viste family. 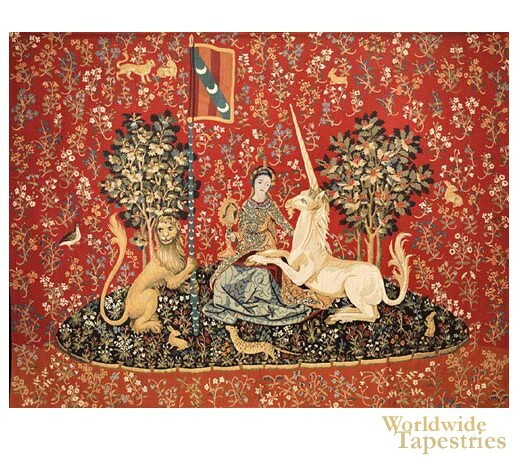 This unicorn tapestry Sight (La Vue) I is backed with lining and tunnel for easy hanging.